In comments yesterday, Electronic Arts' chief financial officer suggested that Online Pass—the program under which gamers who pick up a used copy of an EA Sports game typically shell out another $10 to EA if they want to activate multiplayer for it—has netted the company in the realm of $10 to $15 million since it was introduced in June 2010. That's a paltry sum to a publisher that size, but it doesn't mean the program's a failure. For starters, it's basically pure profit—"found money" as CFO Eric Brown calls it. But as I suggested yesterday, after a year under the program, Online Pass has probably done much to condition gamers to go ahead and buy a retail copy, even if its discounted, rather than pick up a used one. That's because it takes a hell of a long time to get a used title down to where it's a bargain even with the $10 Online Pass hit. The oldest game under the program, Tiger Woods PGA Tour 11 is $27 used at GameStop. The oldest game not superseded (or about to be) by another entry this year, EA Sports MMA is $18, and that series is effectively on hiatus. That's off-the-shelf, of course these titles are cheaper through resellers on half.com or Glyde, but the point is that waiting for value time means waiting for an out-of-date title. So if the Online Pass is more of a deterrent than a product, that's fine. EA Sports doesn't even want you to buy it. "Season Ticket" holders get a 20 percent deal on downloadable content, but the Online Pass isn't eligible for the discount. Sure, "Season Ticket" holders are likely to buy new anyway, but the message is clear. EA wants its $10 if you're buying used. 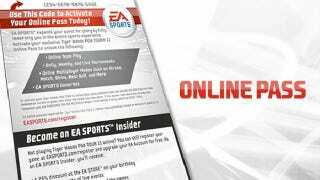 Bottom line, you can forget about Online Pass going away if it doesn't make EA much money. That sucker is here to stay.